There is a lot of attention given to the topic of energy in the news. Solar energy, the usage of fossil fuels, and the state of our environment are all hot button issues. Regardless of where you stand on all of these issues, one thing is clear: home solar energy has revolutionized the way we look at powering our lives. What once seemed futuristic in a sense or unattainable has now become common practice that any homeowner could benefit from. All it takes is making the decision. You’re probably wondering, “Why solar power? 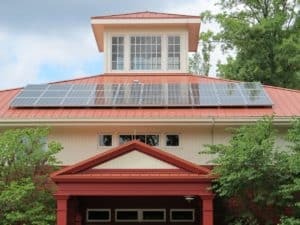 How do I benefit from outfitting my home with solar panels?” The answer would be that there quite a few reasons why you would want to make the switch. Solar energy can redefine the way that you power your home. Here’s how solar energy can be transformative to your life. That’s right. Despite what one might think of the upfront costs involved, switching to home solar energy actually saves you money in the long run. Think of it as a worthwhile investment (more on that later). Many factors come into play here. For one thing, the cost of solar panels has gone down, so that really large upfront cost you might remember from ten years ago doesn’t quite apply anymore. Depending on the type of installation you choose, you could actually go entirely solar. Because the sun is a free energy source, that means you would no longer be beholden to your utility company. Think about it; your electricity could be coming from a source that never runs out. Because solar energy systems store excess daylight captured during the day, you’ll always have reserves to power your home through the night. Not only will you save money on your energy costs, but the federal government has incentivized homeowners to make the switch to solar as well. A big way they have done this is through the use of the Solar Investment Tax Credit. From now until 2019, homeowners can receive a 30 percent tax credit for solar energy systems on their property. This Investment Tax Credit (ITC) allows homeowners to apply the credit to their personal income taxes. After 2019, the percentage will drop. In 2020, it’ll be a 26 percent tax credit and in 2021 it’ll go down to 22 percent. Once 2023 hits, however, the Solar Investment Tax Credit goes away for residential properties. That’s why it’s so important to start making the switch to solar as soon as possible. Who would have thought your energy source would actually increase the value of your home? Talk about redefining the way we think about our utilities. It turns out that prospective home buyers are willing to pay quite a bit more for a house that has solar panels already installed. One study showed that buyers were willing to go as high as paying an extra $15,000 for an average sized solar panel system already installed on a home. And you thought remodeling your kitchen would be a great investment! No home improvement project pays dividends quite like switching to solar energy. In challenging housing markets, that extra benefit of having a solar panel system could be the deciding factor between being able to sell your home and not. Compound an increased home value with lower energy costs and a sizable tax credit and you start to see how transformative home solar energy can be. Depending on where you live exactly, you may have grown accustomed to experiencing power outages during inclement weather or “high volume” parts of the year. Think the summer when air conditioning units are working overtime. Being on the electrical grid isn’t always a sure thing. With today’s solar and the upcoming advancements in lithium batteries you can become self sufficient and independent. The sun is always there, so you’re always using its energy and storing it for later. Solar panels are also pretty durable thanks to not having moving parts. Panels are crafted to withstand extreme weather conditions, so you don’t have to fret about hail or high winds. In the event that something were to occur, you’re covered with a 25-30 year warranty. Feel good reasons are important,too. Your energy choices will go a long way to contributing to lowered pollution, more sustainable fuels, and protecting the environment. Who knew you could do all that just be reassessing your utilities? Making the decision to switch to home solar energy is a big one and it’s a process. At Aztec Renewable Energy, Inc., we get that. That’s why if you have any questions we encourage you to contact us. We’ll walk you through all the information you need to know and help you reach the best solution for your energy needs.